If you pursue any kind of artistic endeavor, you invest a lot into it. Ernest Hemingway once said; “There is nothing to writing. All you do is sit down at a typewriter and bleed.” I’m not a big Hemingway fan, but I think his mastery of the simply stated shines through here. Blood, sweat, and tears aren’t always a metaphor. Having invested so much of ourselves, and our time, into our writing (or any art form), we become quite attached to it, and understandably so. It’s not a coincidence my first entry was called “Your Baby is Ugly.” In a very real sense, our writing can be like our children. We birth it, we raise it, we marvel as it grows and develops, we protect it when we feel it’s being attacked. And sometimes, we even see it die, but please don’t email me about what a bad comparison that is. I’m not saying that the death of something you’ve written is even in the same solar system as losing a child. However, as I said, we do become attached to those things we work hard to create, and so it becomes a handy analogy. Through all the stages, there’s a final step we often forget, which is that our beloved creation takes on a life of its own. It becomes something separate from us and ventures into the world. That hard part is letting go. Now, I don’t mean in the literal sense of submitting your writing. I’m talking about the next step after that, when it actually gets into someone else’s hands. Once you share your writing, it’s not yours anymore. This might sound like a romantic notion, but there’s more to it than that. What I mean is what your writing “means.” Sure, you’ll be able to tell people what it’s about: the story, plot, and characters, but your thoughts on what you’re trying to express are no longer the only correct ones. Each of us is truly unique. We each take different paths through our lives, and even the things we share in common are seen through lenses shaped by previous experiences. Combine that with our individual genetic predispositions (to whatever impact they may have), our ever changing world, and you can see how astronomical are the odds of any two people having the same set of experiences. As such, we all experience the world in different ways. 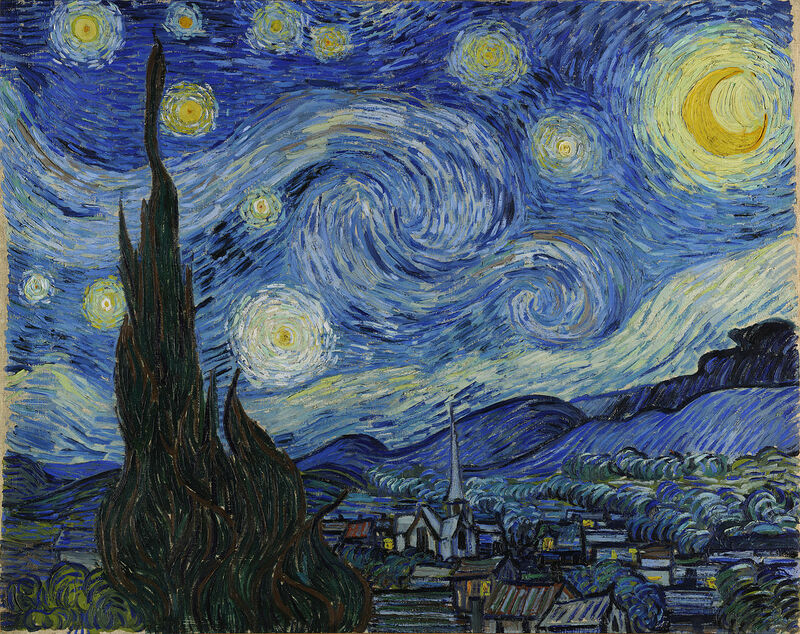 Take Starry Night by Van Gogh, one of the most recognizable paintings in the world. I don’t know if we have any kind of record what Vincent was thinking when he composed this, but honestly, it doesn’t matter. Odds are we’ve all seen this picture. Some of us love it, myself included. Others are more sanguine about it, while still others don’t care for it. Are any of us wrong? Okay, that’s an easy one. How about this; what’s it about? What’s it mean? When you look at it do you see a serene and peaceful night? Does it bring back memories of your childhood? Or do you see a dark and cold night, imagining yourself standing alone on a hillside looking down at the town, at the lit houses where you know you’ll find no comfort? Or do you feel no strong reaction at all? Again, are any of those interpretations wrong? When you let your writing go, you’re offering it up to the world. Someone could read your work and have a reaction to it that is nowhere near what you’d expected, or perhaps hoped. And yet, the very act of putting it out there is an act of surrender. If someone wants to know, you can explain what you were going for, what inspired you, etc. But, your thoughts are now simply your opinion, one amongst many in fact. Think of a song you love. If the person who wrote it, or performed it, came up to you and told you that what you thought the song was about was completely off base, would it really change how it makes you feel? What it does in your mind? I recently posted some poems here, and I didn’t say what they meant, or were about, for the reason I just explained. For me, poetry is especially personal. I can tell you what I was thinking and feeling when I wrote it, I could explain the imagery I was going for, but that’s not as relevant as what you think and feel when you read it. Those poems, like anything I put out to the world, are not mine anymore. They’re yours. They’re ours. As writers, as artists, I think we strive for connection in our expressions. I’m storyteller at heart, and of course I love knowing someone was entertained by a story I came up with, but I’m hoping people find something in it that’s familiar to them. Something that says despite each us being unique, there are countless experiences, thoughts, feelings, “things” we have in common to one degree or another. In a world that is increasing isolated, ironically because of all the social media and interconnectedness of the world, we writers, painters, sculptors, actors, what have you, use our art like a message in a bottle, cast into the vast ocean surrounding our individual islands in hopes it reaches someone else on theirs. This entry was posted in Thoughts on Writing and tagged Editing, Life, Philosophy, Writing by bishopoconnell. Bookmark the permalink.